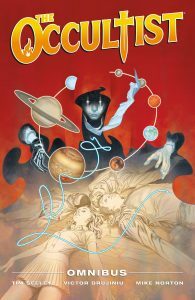 Rob Bailey is acquiring another magical book with The Occultist Omnibus! In 2010, writer Tim Seeley (Hack/Slash) brought his rare mix of humor, horror, and heroes to Dark Horse’s own Mike Richardson’s magical creation in a popular one-shot, which soon transformed into a popular ten issue, two volume series! Artists Victor Drujiniu (The Waking), Mike Norton (Battle Pug), and Jason Gorder (Darkchylde) brought Rob Bailey’s adventure to life while colorists Andrew Dalhouse (Irredeemable) and Allen Passalaqua (Trinity) provide their supernaturally gorgeous coloring skills to the series. The Occultist Omnibuscover is by artist Steve Morris (Buffy the Vampire Slayer).